We have just installed this stunning Cassita Weinor Awning underneath the eaves of this modern property in Romsey. Our client wanted some shade for their bifold doors that open out onto the garden from the dining room. 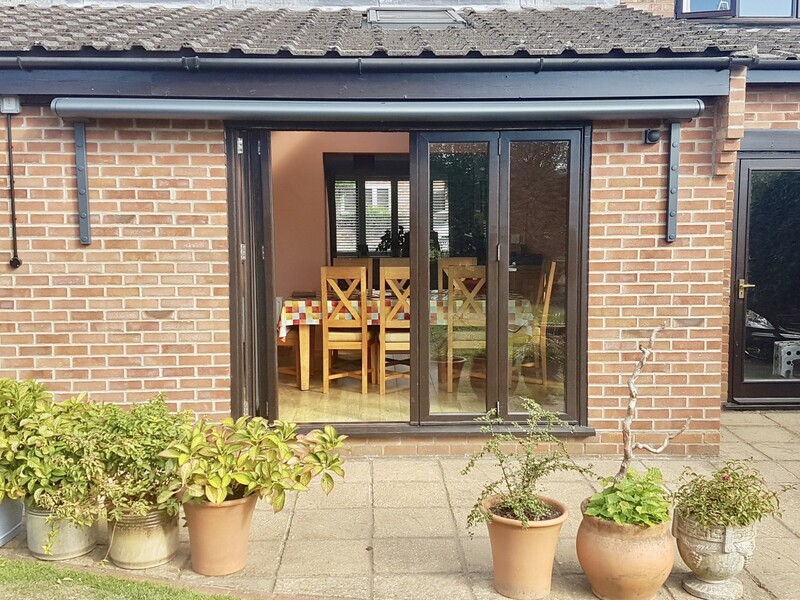 As the awning needed to be fitted into a very small gap between the top of the bifold doors and the eves of the room, we fitted custom-made spreader plates to help spread the load down the wall and ensure that the awning was secure. We colour matched these brackets to the graphite coloured awning cassette. The electric awning is opened and closed using a hand held remote control. The Weinor Cassita Awning is perfect for modern properties. Smart and simple in design, and with all of the mechanics hidden away, this model is neat and tidy and blends in with any outdoor fascia. Internal tensioning arms ensure the fabric is kept taut and the motor is very quiet. We are very careful to make sure that the weight of the awning can be supported by the adjoining wall. If there is insufficient structure above the awning, we use a custom made spreader plate to make sure the load is dispersed effectively. The standard dimensions of our awning spreader plates are 930mm in length with five fixing points that the awning attaches to. Read more about Awning Wall Brackets on our blog. This a wonderful example of the high quality standard of the Weinor Cassita Awning. 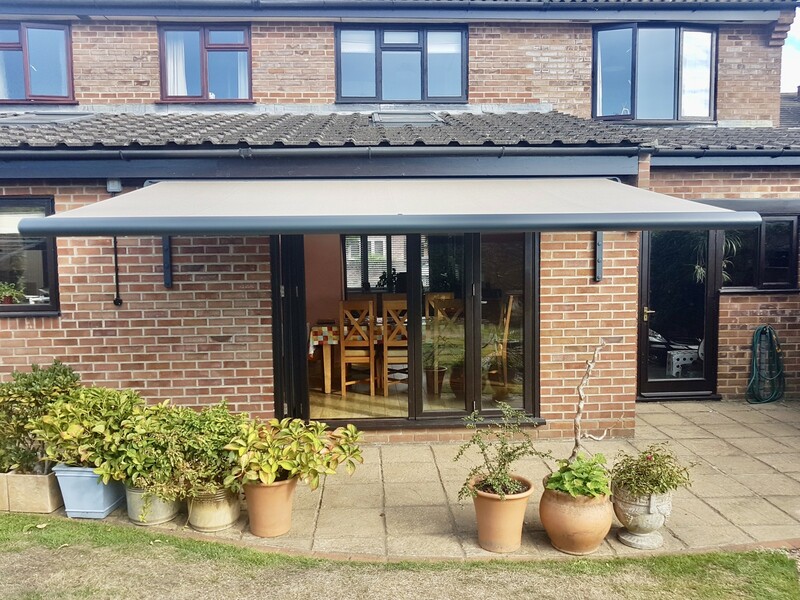 Providing some much needed shade over the bifold doors, this smart garden awning allows our client to enjoy their dining room at any time of day and throughout the year. To find out more about our Weinor Cassita Electric Awning, contact our friendly Sales Team. Call 02381 290170 or email sales@awningsouth.co.uk. Alternatively book a FREE Design Consultation and we’ll visit your home to take measurements and provide you with an accurate, no obligation quote.